The first thing to learn is that all Granites are not the same. Generally speaking the darker the granite the harder the stone. Granites are like diamonds the rarer the stone the more it costs. Not all granite fabricators use quality material “Commercial” quality is available generally from India and China and should be avoided at all costs. At Landford Stone we only use Grade 1 Class A materials these materials are always inspected and selected by our buyer or our agents prior to purchase and importation. Lighter granites will darken when wet but quickly dry out. Landford Stone seal all stone with DRY Treat which has a 15 year warranty against staining. When choosing a Fabricator take great care to ascertain their purchasing policy. 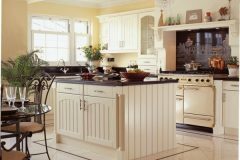 Question their testimonials, remember that genuine recent testimonials indicate recent happy customers always take up references if the company is not known to you or your friends or has not been recommended by your kitchen company. 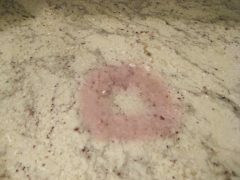 Never buy granite with movement or colour veining without selecting the actual slabs that will be used. It is impossible to choose a stone from a 100 x 100 sample unless it is totally even in colour and graining. Photos of our current stock are always available both from our yard and from our Italian stocks, ask and we will e-mail images to you. At Landford Stone we carry over 1000 slabs of stone in stock at any time. Slabs can be selected and reserved for your project. Unreserved slabs can sell at any time to insure the slabs that are right for you are held early selection is recommended. Making such an important purchase on the Internet can be fraught with pitfalls, not least the credit worthiness of the organisation that you are about to entrust with your money. Believe me we hear some horrendous stories. Lastly but not least question the after sales policy. Does the company have one!!!! Should a problem become apparent with your stone will they immediately attend site? Give you honest advice? And give the level of service that marks the customer satisfaction policy that is the hallmark of the countries leading fabricator of quality stone LANDFORD STONE.